Balocco is a racing venue in Italy with 372 laptimes. And add 2:51.61 for RS6 C7. Yeah and the M4 GTS has better weight balance and grippier tyres than the Giulia Q, as well as better power to weight ratio. Maybe the GTS has worse brakes and overall worse handling, And it may be much easier to drive then the GTS hence they can push it more, And again my previous statement. But i do agree the QV shouldnt normally beat a GTS as it has its hands full with n M3 Competition. Yup Giulia Q is actually slower than the 450hp M3 Competition on most track tests and about equal with the standard 430hp M3. No way the Giulia is a whole 7 seconds faster than the M3 and faster than M4 GTS. Its a bit faster then an M3 in everything, And a Comp M3 is usually faster round tracks, Atleast 6/10, But i think a 7s difference is absurd, But again, my previous comments. Maybe its a different layout? 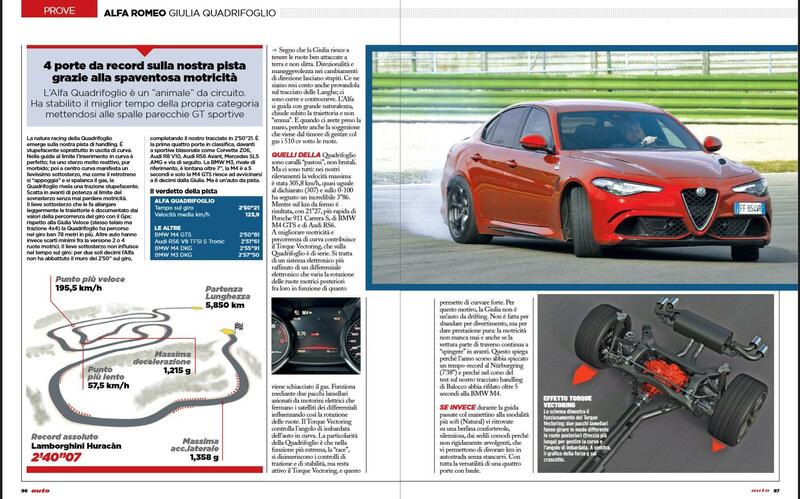 The alfa romeo Giulia Quadrifoglio 2.50.21 Lap Time must be added. It was tested by Auto.it magazine.